Sharp and Docomo have just announced the flagship of their Summer 2016 collection, the new Aquos iPhone... oops, sorry, I mean the new Aquos Zeta SH-04H. In a new and natural form that they call "Comfort & Quality", blah-blah... "Oh, Sharp are trying to copy iPhone," I said to a friend when I saw the release announcement. "Jesus. They didn't go half-way either. Probably could use iPhone cases," he replied. Have to wonder if this is influenced by the new major shareholder in Sharp Corp., Foxconn (Hon Hai), the manufacturers of the iPhone. Other than the completely character-lacking form factor, the new Aquos SH-04H is an impressive phone indeed. Just has way too much bezel on the top of its 5.3-inch full HD screen. Oh, by the way, it is exactly the same as the Softbank Xx3, the only difference being the "docomo" label where the Softbank model has "Aquos". The display relies on the new high-speed IGZO (120 Hz refresh rate) technology we saw in last year's winter collection. Same S-PureLED backlight that ensures bright and crisp colours and faithfully reproduces the entire RGB palette. There's a new and improved image processing engine, the announcement says, which promises clear and vivid detail of images and video. A new feature one is sure to notice is Relax Auto: the display will switch over to 60 Hz refresh rate and reduce blue light to fight eye fatigue. The phone's AI engine will learn your sleeping habits and adjust backlight and screen refresh rate accordingly to help you fall asleep easier. More details on the study and trials here (in Japanese). Performance should be even better compared to previous models, thanks to the quad-core 64-bit Kryo Snapdragon 820 processor (MSM8996) built using the new 14 nm FinFET tech, with two 2.2 GHz cores and two 1.6 GHz cores, and the Adreno 530 graphics adaptor whose processing capability includes 3D games as well. 3 GB RAM and 32 GB built-in storage, expandable to 200 GB using microSDXC cards should suffice perfectly. This processor also supports the MU-MIMO technology that ensures doubling the speed of Wi-Fi connectivity, provided that you have a compatible router. And Carrier Aggregation for combining LTE frequencies for even higher LTE speeds of up to 187.5 Mbps. The camera sensor has now been increased to 22.6 megapixels, with improved optical image stabilisation, f/1.9, Ricoh GR-certified lens, Night Catch II, real-time HDR. The camera start-up time is now even faster, at 0.4 seconds, and is able to auto focus within 0.02 seconds. There is a larger variety of pre-programmed shooting modes, including the familiar Framing Advisor. One new camera feature is "Capture Later" which allows recording a short video in 4K2K resolution at 240 fps that can later be decomposed into frames and the desired best shot captured as a photo. The camera can film 720p video at 240 fps and 1080p video at 120 fps that can later be enjoyed on the phone thanks to the smooth 120 Hz refresh rate of the IGZO display. Like the previous models, the camera can also shoot super slow video and time-lapse - and frame interpolation technology allows for the unprecedented 10x frames, e.g. 120 x 10 = 1200 fps. The video camera now supports the H.265 codec for higher quality, yet smaller size videos. The inner camera has a 5-MP wide-angle sensor (85 degrees). Panorama selfies, anyone? The Aquos Zeta SH-04H comes with a newer and improved version of Emopa, version 4.0. Sharp are actually advertising it as an Artificial Intelligence smartphone. Unfortunately, all of this remains inaccessible to overseas fans who do not speak Japanese. The Aquos Zeta SH-04H comes with an improved UI thanks to further development of the Grip Magic sensors, now four of them – two on the sides and two on the back and front of the phone. Hold the phone and it will turn on when lifted. Since the fingerprint sensor is installed on the side of the body, you can unlock the phone just by holding it and have it ready to operate as soon as you lift it. Twist Magic allows you to twist the phone (rotate it about 90 degrees and back while holding it) to switch between working applications. An auto scroll feature has been added, too: you can start automatic scrolling of content by pressing your finger onto a dedicated icon. Also available is the Clip Now feature, previously only found on the Aquos Crystal models – slide your finger left to right on the top edge of the display to capture a screenshot. Further extras include the Feel UX, display-off when putting the phone in your pocket, sweep on, and Bright Keep – and Glove Mode - thanks to increased sensitivity of the touch panel, it can now be operated using gloves. Like earlier models, the Aquos Zeta SH-04H can play Hi-Fi music, including 24-bit WAV and FLAC files – Sharp recommend the Google Play Music app because their own built-in Music Player can't play such files. One tested, and IMHO better alternative to Google's is AIMP Player for Android. The phone is waterproof (IPX5/8) and now dust-proofing (IP5X) is back! The display uses a 2.5D imitating raised water surface, thus achieving "a beautiful round shape that creates a sense of unity between the display surface and the frame". The glass is chemically tempered (Corning® Gorilla® Glass 4) to withstand scratches and impact. The side frame is metal, and the back panel is hard and scratch-resistant, like in the Winter 2015/2016 collection. 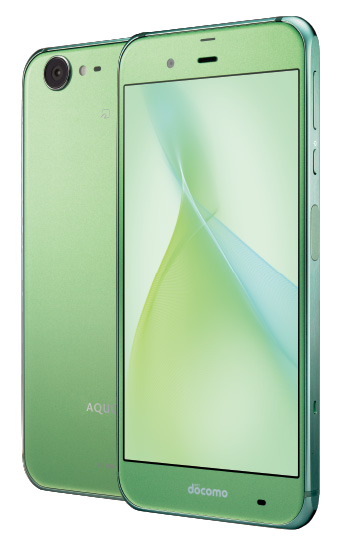 Docomo are offering the Aquos Zeta SH-04H in white, green, and black. The pe-installed OS is Android 6.0. The upgrade to Android 7.0 Nougat rolled out on 15 December 2016. On 20 June 2018, the SH-04H received an upgrade to Android 8.0. The device measures 149 × 73 × 7.6 mm and weighs 155 grams. The battery capacity is 3000 mAh, which should easily last a few days.